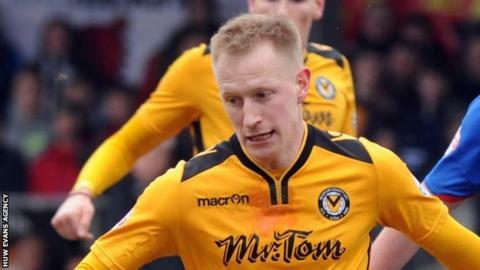 Scott Boden eased Newport County's relegation worries with his 11th league goal of the season to defeat Carlisle. Newport's top scorer tapped in Alex Rodman's set-up as they moved 10 points clear of the League Two drop zone with their first home win since November. County dominated and Boden had wasted a first-half one-on-one when the striker dragged his shot wide. Carlisle ended the game with 10 men as Brandon Comley was sent off for a second yellow late on. Newport's only concern was an injury to defender Scott Barrow, who was taken off on a stretcher with a head injury. Match ends, Newport County 1, Carlisle United 0. Second Half ends, Newport County 1, Carlisle United 0. Mark Byrne (Newport County) is shown the yellow card for a bad foul. Foul by Mark Byrne (Newport County). Substitution, Newport County. Dean Morgan replaces Scott Boden. Attempt missed. Conor Wilkinson (Newport County) left footed shot from the centre of the box is close, but misses to the right. Second yellow card to Brandon Comley (Carlisle United) for a bad foul. Conor Wilkinson (Newport County) wins a free kick in the attacking half. Foul by Janoi Donacien (Newport County). Brandon Comley (Carlisle United) wins a free kick in the defensive half. Corner, Newport County. Conceded by Michael Raynes. Ben Davies (Newport County) wins a free kick on the right wing. Substitution, Carlisle United. Derek Asamoah replaces Jabo Ibehre. Alex Rodman (Newport County) is shown the yellow card for a bad foul. Attempt missed. Scott Boden (Newport County) left footed shot from outside the box is close, but misses to the left. Yan Klukowski (Newport County) wins a free kick in the defensive half. Charlie Wyke (Carlisle United) wins a free kick on the left wing. Foul by Macaulay Gillesphey (Carlisle United). Attempt missed. Brandon Comley (Carlisle United) right footed shot from outside the box is close, but misses to the right. Corner, Newport County. Conceded by David Atkinson. Substitution, Newport County. Yan Klukowski replaces Medy Elito because of an injury. Substitution, Carlisle United. Hallam Hope replaces Alex Gilliead. Substitution, Carlisle United. Luke Joyce replaces Antony Sweeney. Alex Rodman (Newport County) wins a free kick in the defensive half. Attempt saved. Alex Rodman (Newport County) right footed shot from more than 35 yards is saved in the top centre of the goal. Attempt missed. Scott Boden (Newport County) right footed shot from the left side of the six yard box is close, but misses to the left. Corner, Newport County. Conceded by Mark Ellis. Attempt blocked. Conor Wilkinson (Newport County) right footed shot from the centre of the box is blocked. Corner, Newport County. Conceded by Brandon Comley.